Hello, dear friends! I want to wish you all a very Happy New Year in 2016. I am grateful for all your support, loyalty, and inspiration you have given me this past year. It’s been a good year, but a tough one too. Just for fun, here’s a video of a few cats singing Auld Lang Syne. “Auld Lang Syne” Scots poem written by Robert Burns in 1788 and set to the tune of a traditional folk song (Roud # 6294). It is well known in many countries, especially in the English-speaking world, its traditional use being to bid farewell to the old year at the stroke of midnight. It is also sung at funerals, graduations and as a farewell or ending to other occasions. The song’s Scots title may be translated into standard English as “old long since”, or more idiomatically, “long long ago”, “days gone by” or “old times”. Consequently, “For auld lang syne”, as it appears in the first line of the chorus, might be loosely translated as “for (the sake of) old times”. Our precious rescue dog died in 2015 at 14 years of age. He helped me with all my dog product reviews in this blog. Not a question … just HAPPY NEW YEAR!!! In answer, I would really hate to choose between having either dogs or cats as they each fill a special place in my life & heart. They are each one so different! Feb. ’17: Am very sorry to read about your Jake; losing them is so hard; they take a piece of our heart with them. It is always good when we can treat them to a good life and a lot of love for a while at the end. I now get cat & dog rescues older than 5 years of age and dogs over 60 lbs. My last rescue dog, Parquet, a 60# Golden deceiver/Lab experiment, came as a dumped puppy of 2 months & lived within two weeks of being 17 years old. He has bonded so closely by now that he is developing separation anxiety and is my shadow now but I don’t mind at all. After 3 previous homes that I know of, a shelter plus a family who gave him away after 5 years (! ), plus the grandma who saved him from ‘the pound’ for a few months, I hope he knows that he is here to stay no matter what. I’m afraid that it is true that dogs do have a sense of time. My job is to live many more years so he can, too. Good! I’m so glad my video was able to bring you a little cheer. Have a wonderful new year. Meow. 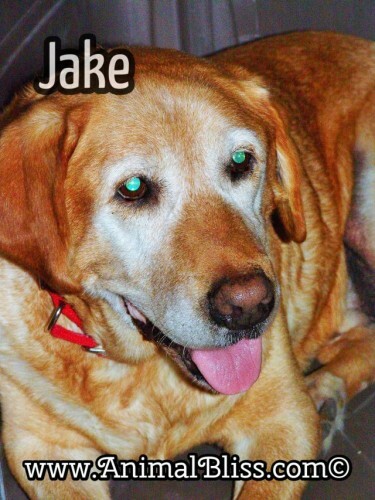 So, so very sorry about the loss of Jake. Thank you, Christina. We do miss Jake but are so thankful that we could make the last few years of his life pleasurable for him. Take care, and thanks for visiting my blog. Thank you, Jo. Jake was a beautiful old boy. We rescued him. He’d spent the first 12 years of his life living in a wire cage outdoors, 24/7. He got to spend his last 2 years with him and are grateful for that. Thanks for stopping by my blog. Peace. Happy New Year to you, and may it be a better one. (Enjoyed the video – cute). Thanks for stopping by my blog, Alana. Here’s wishing you a wonderful new year too!